Robert James Draycott was born in Beeston on 4 October 1897 and baptised at St Mary the Virgin Church, Hunsley, Yorkshire on 1 November 18992, one of four children and only son of Robert Andrew and Eliza Ellen (née Whitehead) Draycott. Robert senior was a native of Long Eaton and had married Eliza Whitehead in Beeston in 18953 and it was there that they started their married life, before the family moved to Eastleigh, Hampshire4 and to Leeds for a while. By 1911, the family, including four children, had moved back to Beeston and was living at 4 Myrtle Grove5. By then, Robert senior had found work as a cabinet maker at Ericssons where their eldest daughter was also working as a polisher. Another daughter worked in the lace trade while Robert junior, then aged 13, was working at a market garden. However, by the time that war was declared in 1914, the family had moved to the Sheffield area - Eliza's birthplace - where Robert Andrew and his wife were to remain for the rest of their lives. Robert James started work as a miner. Robert's surviving Army Service Record6 tells a very sad story of a brave young man. Clearly wishing to be amongst the first to join, he enlisted on 3 September 1914 at Sheffield. Although aged not quite 17, he declared that he was 19 and was duly accepted for service with the East Yorkshire Regiment. It seems that it was a decision he was to eventually regret but, for the moment, he would have been fully occupied with army training at Wareham Camp in Dorset7. He was to join 7th (Service) Battalion, part of Kitchener's New Army, one of 35 battalions raised by the East Yorkshire Regiment during the Great War. On 14th July 1915, Private Draycott landed at Boulogne with his regiment, as part of 50th Brigade, 17th Division, for action on the Western Front7. Over the next few months the battalion saw intermittent action while spending much time around Ypres, constructing and repairing its trench positions in the face of deteriorating conditions. By November the men faced extremely wet conditions with many up to their knees in mud and water. The battalion war diary recorded that the arrival of 250 pairs of thigh boots was 'looked upon as a God send' and morale was almost instantly improved. Despite some respite spent in billets in Ypres, the men continued to face atrocious conditions whenever attempts were made to improve the trenches. The prevention of trench foot and frost-bite was now a priority, using 'Thermopede' a French preparation. It is not surprising that sickness levels rose and Private Draycott was amongst those who were hospitalised for a time with influenza. Much of the first half of 1916 was spent, with occasional reliefs, in the trenches, opposite the enemy, repairing and rebuilding trenches and barbed wire defences with occasional exchanges with the opposing forces. In late June, the preparations became concentrated specifically on a planned attack on Fricourt as part of the Battle of Albert which was launched on July 1st. The attack took place with much confusion but Fricourt was taken on the next day but with heavy casualties - four officers were killed and one was wounded. 20 other ranks were killed, 72 wounded and 17 were missing. The battalion was then directed against Mametz Wood, an action which failed in the face of deteriorating weather conditions and a determined enemy. Amongst further heavy casualties - one office killed, two wounded and about 140 other rank casualties - it appears that Private Draycott was hit in the arm and was evacuated from the field. By the 16th July, he had been passed down the medical care chain and had arrived at No. 25 General Hospital at Hardelot-Plage, in the Pas de Calais8, to be treated for a shrapnel wound to his left arm. Two days later, on the 18th, he was moved to England on the Hospital Ship 'St David' and taken to Western General Hospital in Manchester9 for treatment and recovery. By the following month he had recovered sufficiently to be allowed leave. Unfortunately he overstayed and was disciplined accordingly and posted to Rugeley Camp. Clearly, his wound was not going to mean his release but a probable return to the front. This would have been a terrible prospect for a young man who had already experienced the terrible dangers and awful conditions of trench warfare. In November he went absent without leave from an overseas draft before being apprehended by the police after 20 days. Desperate to avoid another overseas posting, he twice again went absent without leave in January and February 1917. Inevitably, he embarked for France on 3 March 1917 and rejoined his battalion on 20 March which was then in the middle of a period of recreation and training. Inevitably, this was not to last and in early April, the battalion moved to billets in Arras ready for the Battles of the Scarpe that followed over two weeks with inevitable heavy casualties. Private Draycott was killed during this time, barely a month after his arrival - and still only 19 although having served for over 2½ years. As his body was never identified, Private Draycott is remembered on the Arras Memorial, in the Faubourg-d'Amiens Cemetery, Arras, which commemorates almost 35,000 servicemen from the United Kingdom, South Africa and New Zealand who died in the Arras sector between the spring of 1916 and 7 August 1918, and have no known grave10. He was posthumously awarded the 1914/15 Star, Victory Medal and the British Medal. Robert's Army financial effects of £4 8s 7d and his War Gratuity of £12 were paid to his mother, as his sole legatee. This gratuity amounts confirms the date of his enlistment as September 191412. 3Their marriage took place at Beeston Parish Church on 31 March 1895 (Notts Family History Society Marriage Index). 51911 Census, Piece 20430 RD429 SD3 ED5 Sched 244. Robert James' siblings were Annie Elizabeth (b.1895), Lilian Maud (b. 1896) and Edith Ellen (b. 1899). 6His Army Record survives and can be seen on ancestry.com. This provided details of his enlistment, training, wounding and evacuation, later absences without leave and his final service in the field. 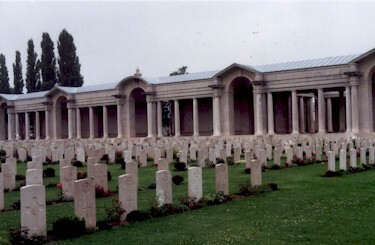 10This description of the Arras Memorial is based on that included in the Commonwealth War Graves Commission website. His entry on the memorial in Beeston Parish Church, wrongly names his regiment as York and Lancaster Regiment. 11Robert James' medal awards are recorded in the Medal Rolls and on his Medal Card, available on ancestry.com.